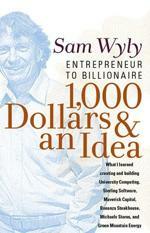 Giveaway Of Another Copy of $1,000 Dollars & An Idea - Entrepreneur To Billionaire. Giveaway Of Another Copy of $1,000 Dollars & An Idea – Entrepreneur To Billionaire. Mr. Wyly wrote this book to tell readers what he learned while starting all his various companies – University Computing, Maverick Capital, Michaels Stores and Green Mountain Energy. The title of the book stems from the fact that he took $1,000 of his savings to start University Computing, took it public two years later, and became a millionaire at just 30 years old. If you should be reading about anyone starting with nothing and growing a business into something this big, it is definitely Mr. Wyly. Without sounding like an egotistical businessman, he talks a lot about exactly what it takes to start and grow very successful businesses, which is great for people like me working to get their own things going. It’s a great combination of both a story and advice and makes for a pretty interesting read. The most important thing to take away from this book? Have confidence in yourself, as you will never succeed if you don’t. If you are struggling to start a business or need some encouragement along the way, you should check out this book. So, want to win this copy? I am making it easy this time – all you have to do is leave a comment here on this post (with your email address so I can contact you if you win) and I will randomly select the winner from those who comment. Only one entry per person, open to US residents only (due to shipping costs), and the contest will end Friday, February 6th at 8am MST with the winner being announced later that morning. Good luck! Giveaway has ended. Let me jump right in here. I am finally getting myself motivated to enter the entrepreneur realm. This sounds like a good book to help point me in the right direction. Love the site and hope I manage to get this book because I need any bit of help I can get! i’ve heard great things about this text. pls include me in the drawing. Thank You, I belong to your blog. Starting a buisness is very hard, but if you have the right ideas it can work. I just found your site this morning and subscribed, very happy to have found you! Would love this book, of course! 🙂 Thanks! Been reading your blog for a while now. Very well done. Plus, Wyly is a fellow alum. Sounds like an interesting book. Count me in. Love the premise of the book. Thanks for the post. I ‘ve become a regular reader of your blog, thank you. Sounds like a great book….time for me to start another business! Sounds like a great book. It may be just the thing I need to kick start a business. Thanks for the chance. maybe this book will make me a billionaire too! love your site read it daily i could really use this book – hope i win! Also, I’d love a copy of this book! I hope to make a run at my first start-up but hopefully will be doing so while keeping my full-time job until things take off. Sounds like a book that I need to read. The book sounds great! I’m a sole proprioter/SBO who would love to expand, but scared to take that step! Sounds like an interesting book – I’d love to give it a read. Having worked in one of Sam’s companies I saw the ideas in his book in action. They truly work. I want to be a millionaire!!! Very interested in this book! Sounds like a great book! Thanks for the great information. Looks like a good read. I’m very interested in reading it. thanks for your blog and this opportunity. i hope i win! i liked that you wrote, “Without sounding like an egotistical businessman…” i may just go get this book even if i don’t win. Sounds like a great book. Sign me up. Let’s put the pedal to the medal on this one! I just found your website. Looks like I am going to have to set some time aside each day to read. LOTS of good information! Count me in. Any chance two comments counts for two chances of winning? Cause I will comment all day!